IDF reveals Hamas use of grenades, pipe bombs, and live fire in attack on Israeli troops. The IDF revealed new information Tuesday afternoon about the violent attempts to breach the Gaza security fence by Hamas terrorists during Monday's riots. 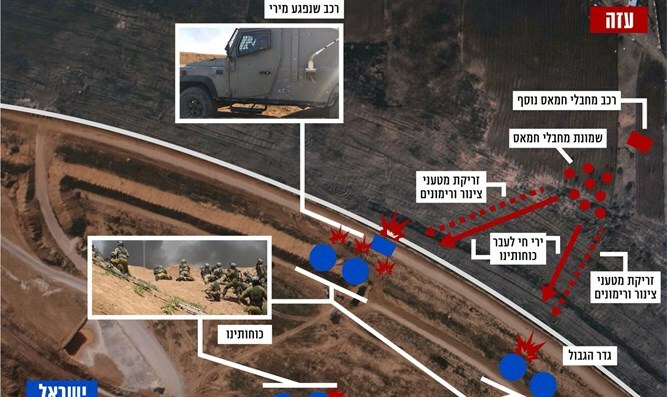 IDF forces recorded video documentation of a Hamas assault on the border fence in the northern Gaza Strip in which terrorists used explosive devices. Eight terrorists threw pipe bombs and grenades at the fence and the soldiers guarding the fence. The soldiers from the Magellan unit used riot dispersal measures to distance the terrorists from the fence. In response, one of the terrorists opened fire on the soldiers. The soldiers returned fire. Following the attack, a tank and an aircraft attacked Hamas positions in the northern Gaza Strip.